Bleu, Bleu Water! 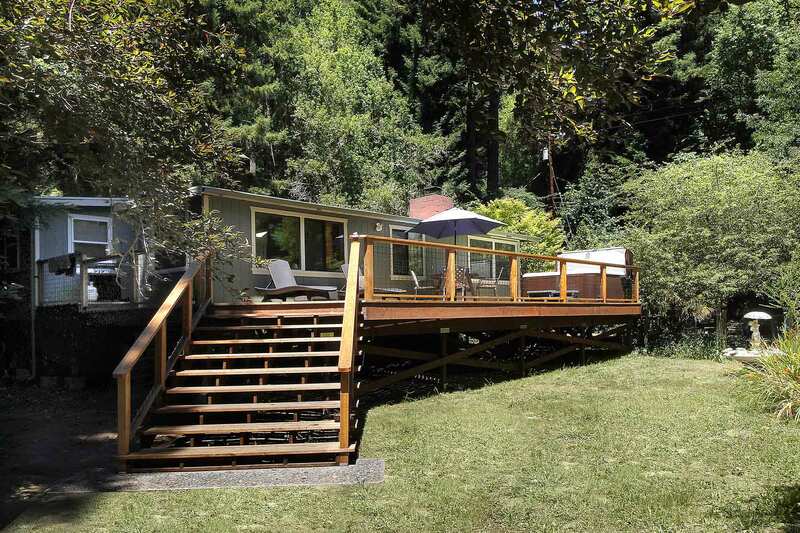 Cozy, Elegant Updated Cottage on Austin Creek, Redwoods, Wood-Burning Fireplace + Gas Fireplace, Wrap-Around Deck, Hot Tub, Outdoor Dining, Flagstone Patio, Firepit, Loungers, Loosely Fenced Area in Yard. 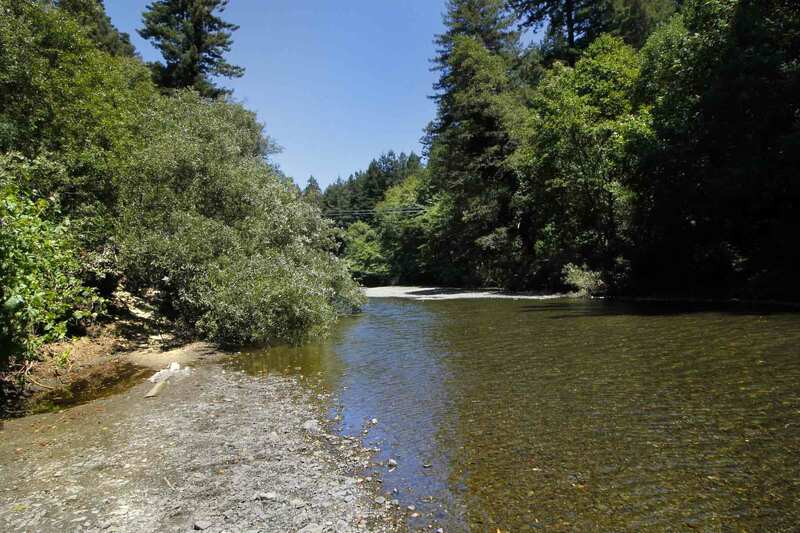 Easy Direct Creek Access; Short Drive to Coast, River Beaches, Wine Tasting, Golf. Wi-Fi, Landline Phone, Cable TV. Your Well-Behaved Dog is Welcome! 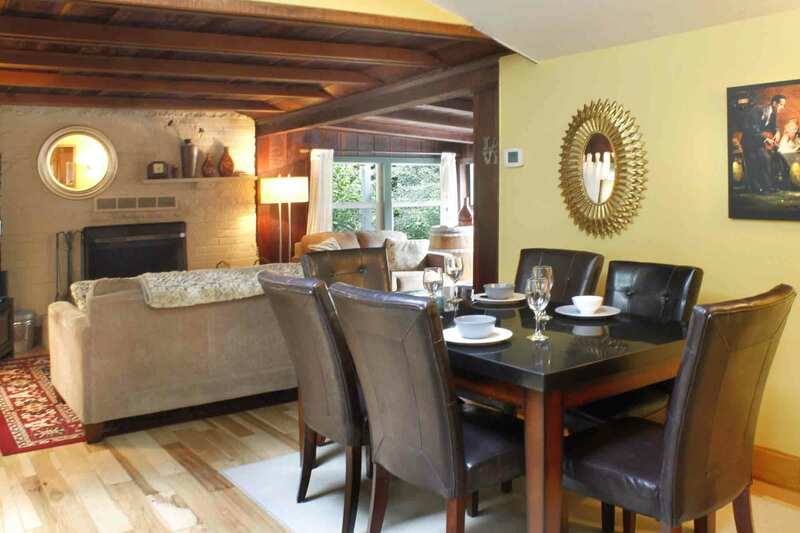 Bleu Water's large living room includes a reading area and formal dining area. 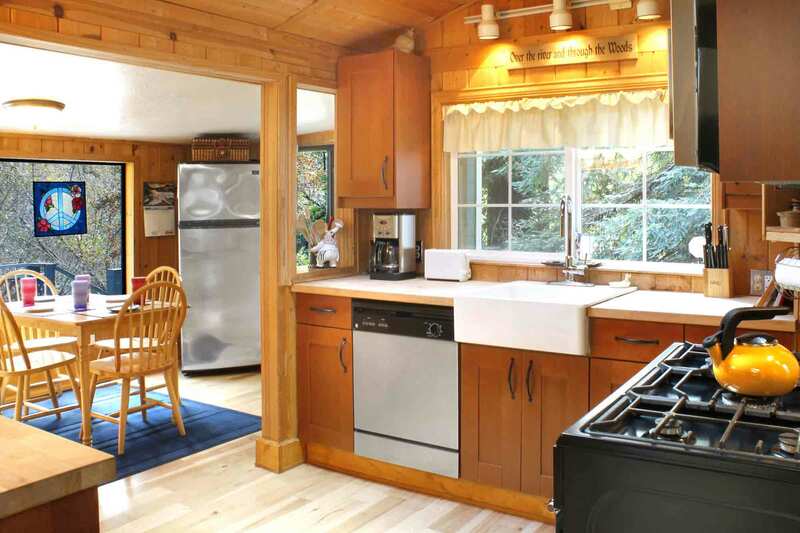 Mostly open to the living area, the kitchen offers a breakfast nook on the far side. Directly off the living room, there are two bedrooms and a bathroom. Opening from the living room, there's a deck with outdoor dining and hot tub. Steps lead from the deck to the rear yard, patio, firepit and creek. House is approx 990sf. Ceiling Fan (kitchen). NO A/C. Nice house and layout. Great place to enjoy the quiet and just hear the creek in the background. Very private and the hot tub is so much fun! We loved our stay. I found the other reviews to be accurate. 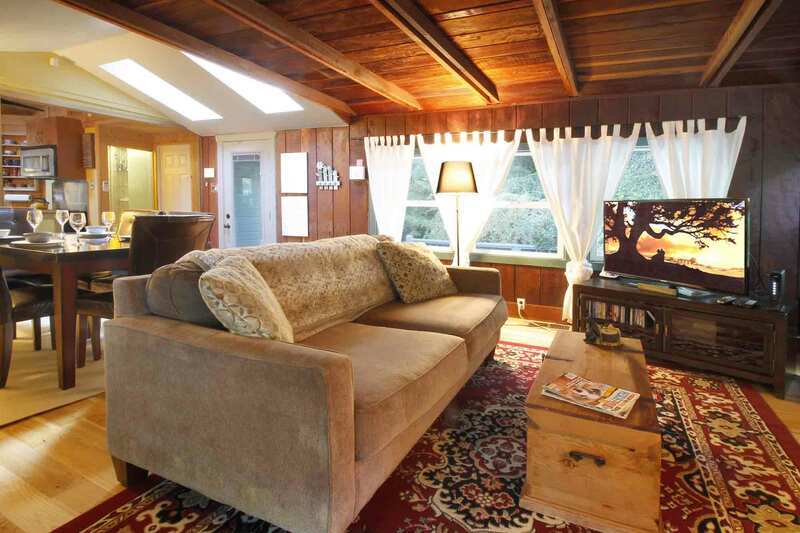 This is a clean, cozy, private spot with great creek access and only a short drive to a the coast or the towns along the 116. "We loved our stay here"
We loved our stay here. great location, very cozy, the hot tub was wonderful, and the grounds are beautiful. the three cons are having to pick up keys from the rental office, we had ants in the kitchen (maybe because it was raining? ), and there's very little lighting in the living room... quite dark. but, we'd definitely stay here again! "Great place to get away"
Great place to get away from everything! A bit far from town, but that is the idea. Dog friendly, secluded and cozy. The spa was great! 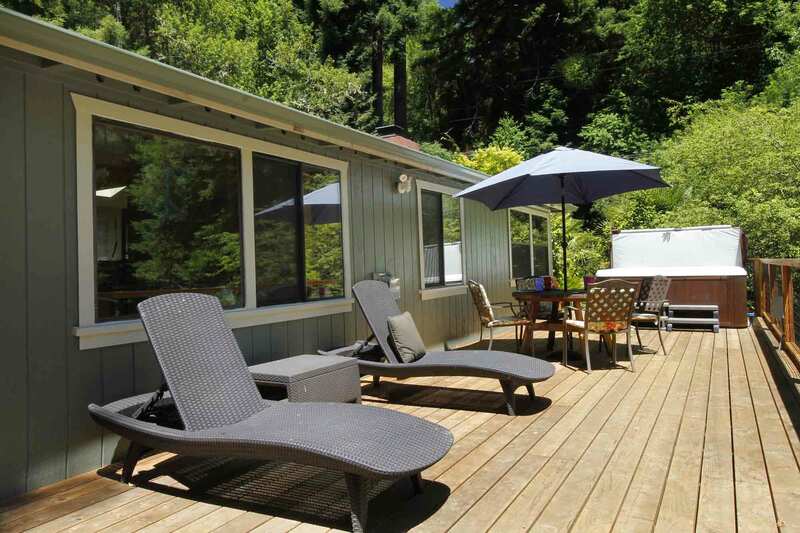 Outstanding location, walk Austin creek bed with your dog, try the bbq grill on the back deck and watch an early forest sunset, hit the fire pit for s’mores and laughter. Tons to do in your own back yard. Loved it. "the location is very peaceful and quiet." We spent a long weekend there and it was very nice! 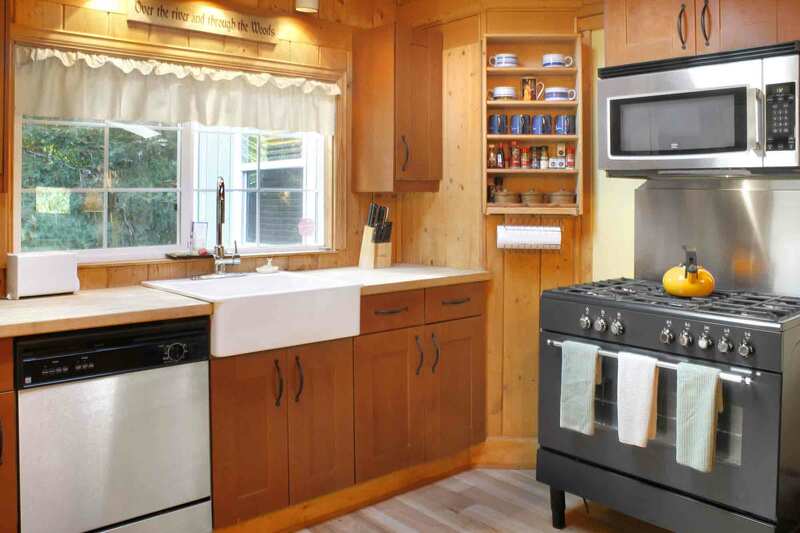 The kitchen is well stocked and the location is very peaceful and quiet. My kids enjoyed the water in the backyard and there is a lot of nature to be appreciated. We will definitely be back! "The photos really don’t do this place justice." My family of four cherished a cozy weekend here. The photos really don’t do this place justice. It’s immediately inviting and charming, the epitome of a cozy cottage in the woods, with pretty, updated touches and clean, comfy furniture. There was nothing better than taking our coffee to the creek early in the morning, and enjoying the sounds of birds as our 2 year old gleefully threw rocks in the water. In September, the creek was still and low; perfect for a little one to enjoy. We picked blackberries, lounged in the backyard, and watched the wild bunnies hop about. We cooked in the well-stocked kitchen, roasted marshmallows, and watched movies (loved Mary Poppins on DVD...old school!). 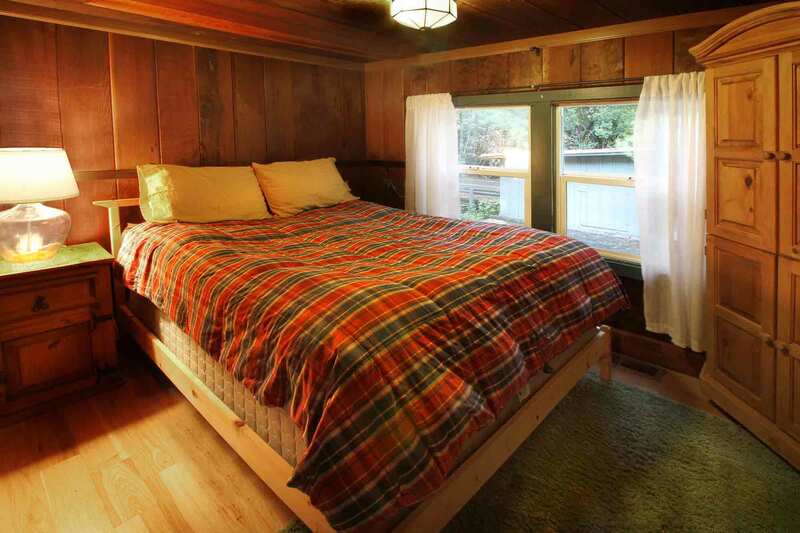 At night, we soaked in the hot tub, stargazed, and fell into comfy beds. Parents of little ones: there’s no bathtub, but the farmhouse sink is big enough for baby’s nighttime bath! The lack of cell service was a welcome surprise. I needed to disconnect and was so happy for the excuse (there’s a house phone for emergencies/peace of mind). The small town of Cazadero has a cool bohemian vibe and we loved exploring, but honestly, didn’t leave the house much. Didn’t want to! This was one of the best Airbnb experiences and we cannot wait to come back. 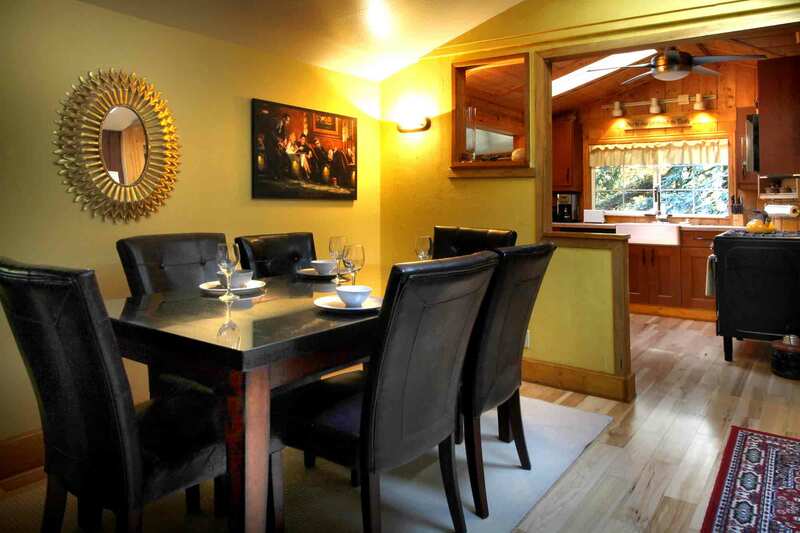 "We truly loved our stay there"
This was a great secluded getaway in the woods. We truly loved our stay there. The kitchen was well equipped which made the two chefs that stayed here happy! We also like bed the hot tub and the creek behind the house. It was peaceful and felt like home. We recommend it! What a relaxing weekend! 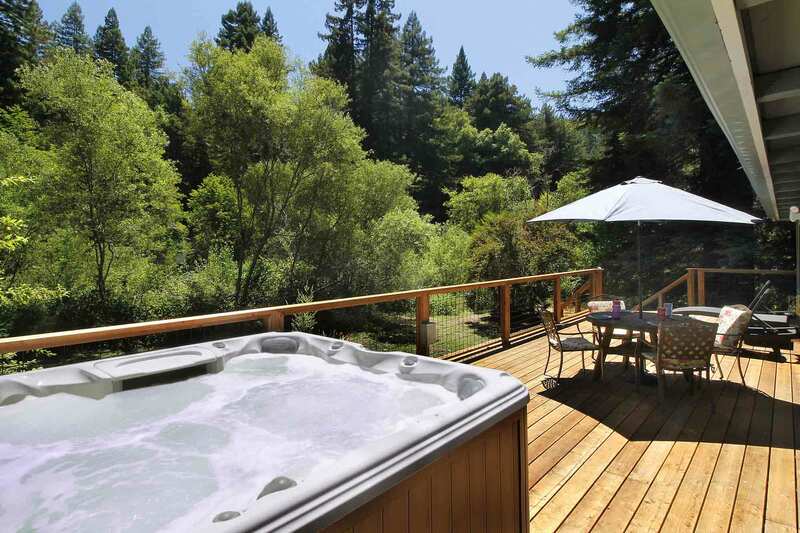 We had the best time relaxing in the hot tub surrounded by redwood trees and the sound of a babbling brook. Our dog loved the backyard, too. "Gets better each stay !!" Really fantastic space, plenty of room for 4+ people. The backyard was great for the dog and the hot tub was lovely even during the really cold weather. Everything was incredibly clean I'd highly recommend staying at this location. We had a relaxing weekend in Cazadero. The hot tub is lovely and larger than it looks in the picture. Great location, close to hiking and the river. Thanks for the review and feedback, Susan. We're glad you enjoyed Bleu Water! We had a great stay at Bleu Water over new years. 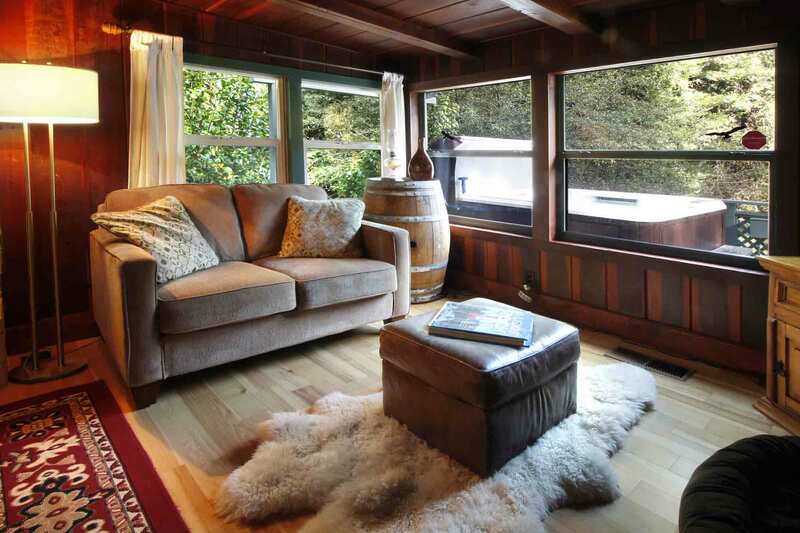 We loved this cozy cabin in the woods, complete with fireplace and hot tub. Couldn't have asked for a better low-key quick getaway only 1.5 hours from San Francisco. Looking forward to coming back in the summer months when we can be outside enjoying the gardens. "A lovely little house on the creek!" We thoroughly enjoyed our stay at Bleu Water! The deck is beautiful and gets lots of morning sun. You can't beat the creek access!! The hot tub was so nice after playing all day. My only negative comments would be the ceiling heights are a little low in some of the rooms (my husband is 6'2" and was feeling a bit squeezed). They could use more storage for those staying longer than a few days. We wanted to unpack and make ourselves at home, but ended up living out of our suitcases. 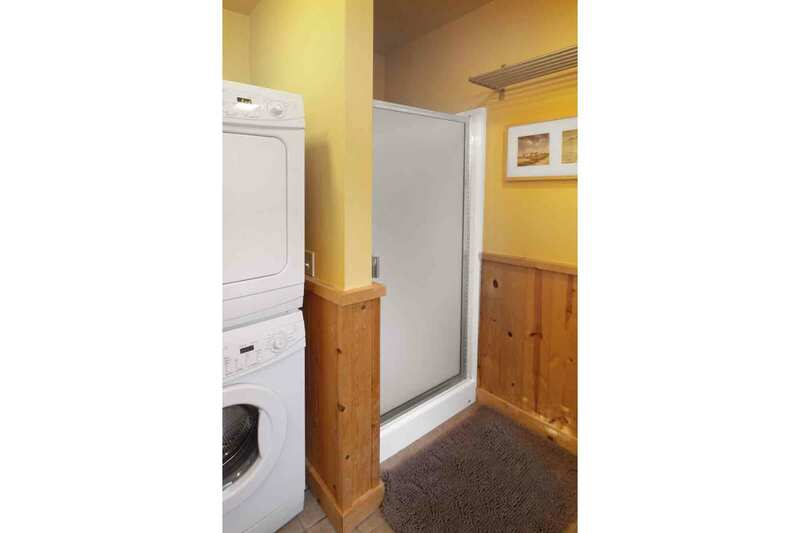 The kitchen could also use some pantry space. Finally, the beds were a bit too soft for our tastes. Once we removed the over-sized feather bed cover, it was better, but not perfect. Overall the house is well maintained and I would totally rent it again..maybe just for 3 or 4 days instead of 7. 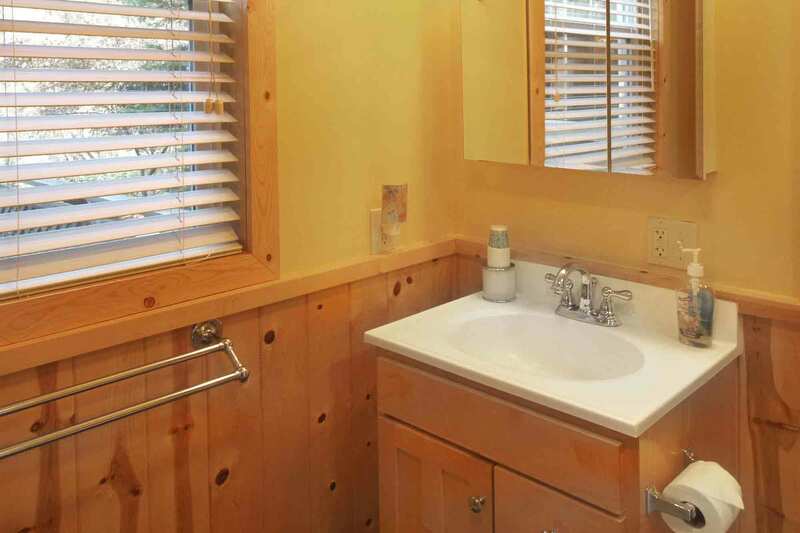 The cabin was beautiful with lots and lots of extra amenities. The beds were very very comfortable. 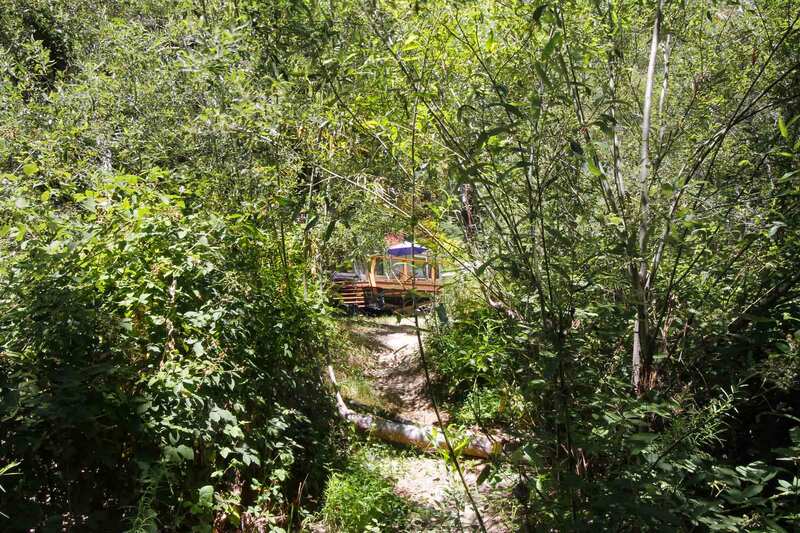 you can walk down from the cabin to the right and find 6 ft deep swimming holes, which were fun to swim in. The creek is very private and very relaxing. Parking was great. Lots of room for the dogs to run. Love the hot tub, the best one I have ever been in! Love the fire pit, great having evening campfires! Couldn't ask for better! We had a excellent time, thank you for making your home available! The pictures did not do the place and the location justice. This was one of the most peaceful and wonderful places I have visited. The house is gorgeous. It is not a cabin--it is a home that shows pride and love. The homey touches make you feel welcome. We did not have time to do all we wanted to do. The creek was just steps away, and it was calm and peaceful. The hot tub was fantastic after a long day of wine sampling. We used the gas BBQ and enjoyed just relaxing while we ate. The two bedrooms were cozy and very comfortable. We did not get to use the fire pit, and next time we will have to stay longer. This was a wonderful place; you won't go wrong renting from Russian River Getaways or staying at Blue Water. A stay in a nice house in an good location* that was ruined by uncleaned linens. The pillows and covers wreaked of body odor. I wanted to gag after laying down and smelling it. The house is nice, and the facilities are good. The hot tub and back garden are nice and the river just beside the back yard. * The road beside the house is very noisy, even throughout the night. This will impact your sleep in the front room and when you're trying to relax by the river. We wanted to get away from the hustle and bustle and this was the perfect spot. 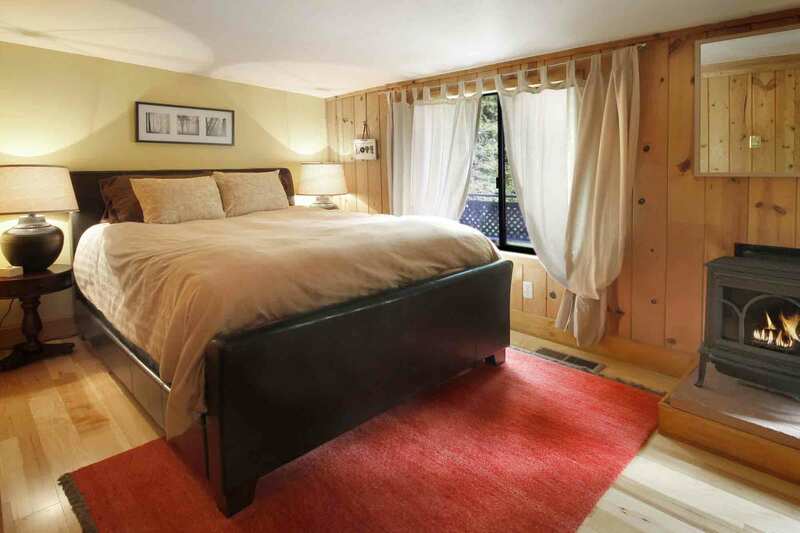 It is truly a gem tucked away with added privacy. The recent updates are beautiful. The amenities were plenty. The bed is extremely comfortable. It is paradise. We brought our 2 dogs with us and they were able to run, play and roam freely in the spacious yard. The creeks that border the property are clean and serene. 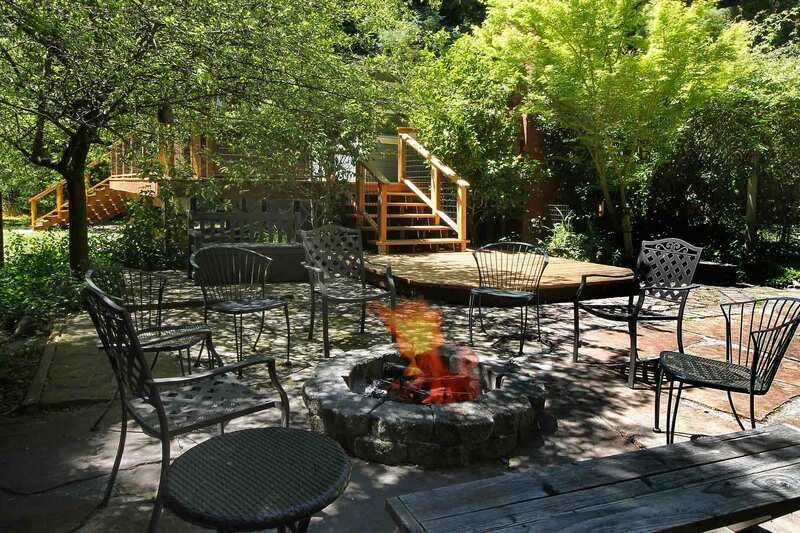 There is a nice outdoor seating area with a fire pit. The barbecue is conveniently set on the deck outside of the kitchen. It really felt like home away from home. The house is located perfectly for a day trip to the beach and beautiful scenic drives. We will be back. The only thing I will do different next time is bring groceries and snacks, as the surrounding stores are limited. But hey, that's the hustle and bustle we wanted to escape. Great getaway! The place really fit the description and was a perfect for our memorial weekend stay with 4 adults and 2 toddlers. Would definitely recommend it! "Nice cottage in the woods"
The cottage itself was nice, well-furnished and had everything you need, except we were surprised in the morning to find there was no coffee to go with the nice grinder, coffee maker, and cream provided. Loved the easy access to Austin Creek though, which still had water in September. Some of our deposit was retained due to dog hair, strange as it is a dog-friendly rental - we do not allow our dog on furniture at our home or others homes but dogs shed and there was dog hair on the floor. We had cleaned the place well, washed our dishes, put out the trash and stripped the beds as requested. Good secure off road parking, There is a safety issue for pets or children as the property is not properly fenced and there is easy access to the very busy road from the yard. We would not stay here again because the road noise was horrible and constant and could not even be drowned out with music - the house actually shakes when trucks go by. "A charming cottage in the woods..."
My family and I recently spent a weekend at Blue Water Cottage. 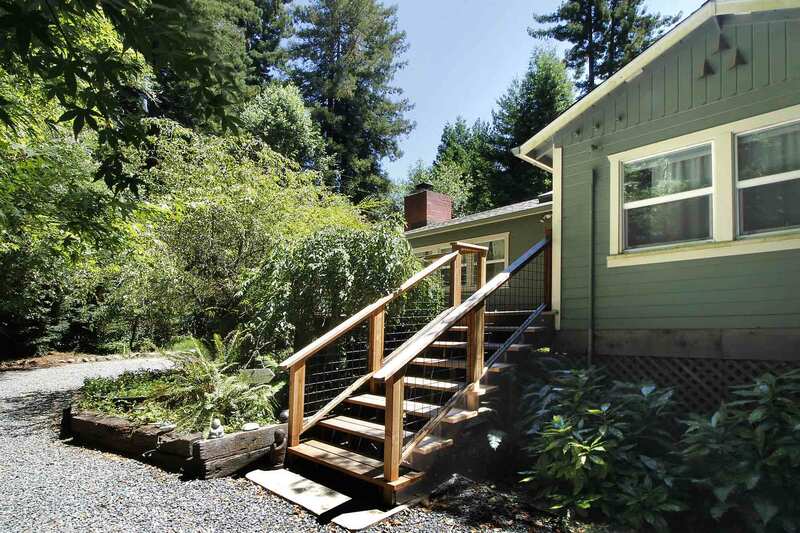 It is a charming residence nestled in the redwoods near Cazadero. We brought our dog and really appreciated the little touches that were there for her comfort. There were bowls for water, a pad for her to sleep on and a long lead out on the deck so that she could safely be out on the deck by herself. The home was just as well equipped for us. The beds were comfortable, there were plenty of cooking utensils in the kitchen to work with and the jacuzzi was a dream. The cabin is only a short drive from the coast and we took full advantage of the fun shopping in the town of Occidental. The parking for this cabin is very secure and behind a great security wall. We couldn't have felt safer. We will definitely be going back to Blue Water soon to enjoy more time in this great location. I recommend you try this wonderful getaway soon. "Better than a 5 star "
This was my second stay here. I found out it only gets better each visit . This place is well maintained , clean and peaceful . I really enjoyed the NICE new jacuzzi while surrounded by red wood trees and stars !! I highly recommend this BlueWater Cottage. Reserve it early cause it stays full . Thank you to the owners and property management . We will be back . The Bleu Water cabin was fantastic and definitely exceeded our expectations. The grounds were beautiful and the cabin was beautiful. 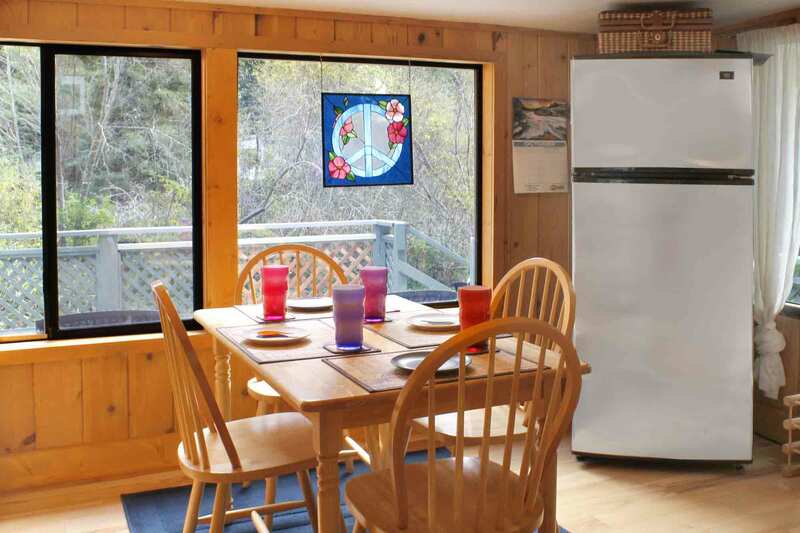 Everything we needed was there - well equipped kitchen, two decks (one with a fantastic hot tub), and a short walk to the creek. It was even better than described. Really enjoyed the private parking area and no visible neighbors. We had a great, relaxing time with the family at Bleu Water. The house is really well maintained, the appliances are all new and the decor is very tastefully done. 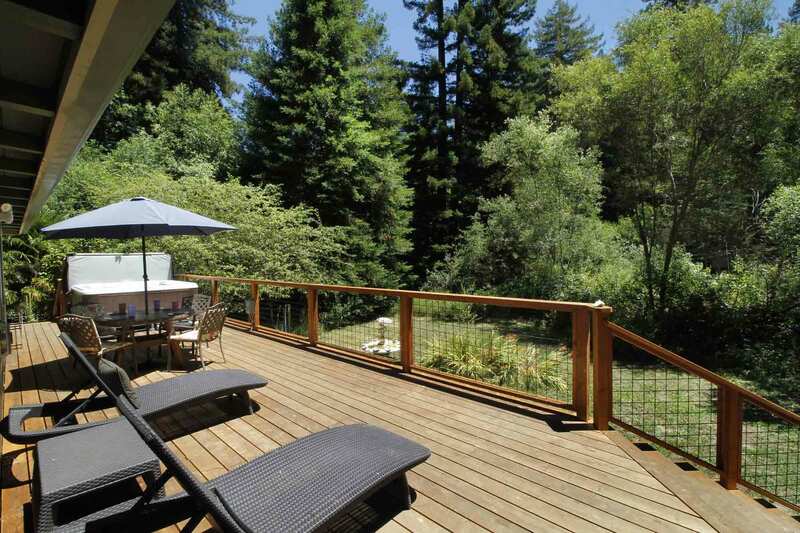 The back deck is large and spacious and gets lots of sun (in the summer at least). In all, we'd highly recommend and would definitely look to come back for our next trip to the Russian River. Also, its very close to Duncan Mills and some great store/market alternatives to having to do into Guerneville for shopping needs.